To be honest last Saturday night wasn't too dissimilar to previous nights I have had. I am not new to walking the streets of London at dark, without much clue of where I going, just following the people head of me and waking up the next morning not wanting to leave my bed. This time however it was for charity and, although it may feel like it in heels, I don't usually walk 13.1 miles. The night was the Shine Night Walk 2014 organised by Cancer Research UK. Entrees can choose the full 26 mile marathon or the half marathon, which I chose. While I have been affected personally by cancer when it came to writing who you were shining for I chose to think of many of my friends who, at my age and younger, have had to go through loosing a parent. Loosing anyone at any time is awful but in your teens and early twenties, right at the beginning of a new part of life, having to deal with the loss of a parent seems just extremely unfair. We started off at Southwark Park where I spent £4.50 on pick and mix sweets. Good start. Everyone was given wristbands which lit up and flashed. Glow sticks were thrown out into the crowd. We all took part in an all important warm up and I got a glimpse at the amount of people attending. We were lead out to a lot of music with shine in the lyrics, and a choir! Which was nice. It was nice to visit a lot of places I haven't been to in a while, followed a while later with places I knew well. Around the Tower of London there is an evolving installation of ceramic poppies. It's been created by artist Paul Cummings and stage designer, Tom Piper. People can purchase a ceramic poppy and it gets placed in the grounds surrounding. You can't see it too well in the photos but it was a sea of bright red. And then we hit a pit stop for a bottle of water and a banana. It was the 4th mile and we'd reached St Pauls. We ended up seeing Westminster from all angles. You can see if you can follow the pictures using the map at the top if you like. As the night wore on I took less photographs constantly around and there are a few miles in between each set. At Pimlico there was a larger pit stop. I loved looking at the house and apartments around. Fancy. We walked right past Victoria station which was a little kick in the teeth after the £16 we had to spend just on a taxi to get there later. London has a reputation for being quite harsh. Busy, people rushing everywhere, no one talking to anyone on the tube, frustration if people are slightly too slow or if tourists stop in front of you take a picture. This is all true. But there is another side. That was the side I saw this time, only one man expressed his frustration at getting past us. People were looking out of there apartments, honking their horns from cars, police vans and even an ambulance, people were coming out of pubs and restaurants to cheer or banging on the windows. Here channel 4 showed their support. We also past the Research Institute and doctors and researchers were outside with a thank you sign and tweets projected onto their building. By the 11th and 12th miles my legs were seriously feeling it so I was glad we were walking through an area I knew well. Southbank, The National Theatre, the second Tate we passed that night and the Globe. We powered on through an empty Borough market and up to London Bridge. The lead up to the finish building had a purple carpet and hallway as we entered. We finished in just over 4 hours including two breaks so that was pretty good. This was the greatest thing to see at the particular moment in time that I took this picture. I believe at the beginning of the night 5 million had been raised. I've raised close to £300 and my just giving page is still open to donations. I was certainly glad to have been done but it was an enjoyable evening. I don't know if I'm up to the full marathon yet; I'd certainly have to do more training! But I don't want this to be the last event I do for charity. Have you ever taken part in something for charity? I would love to hear what you did? 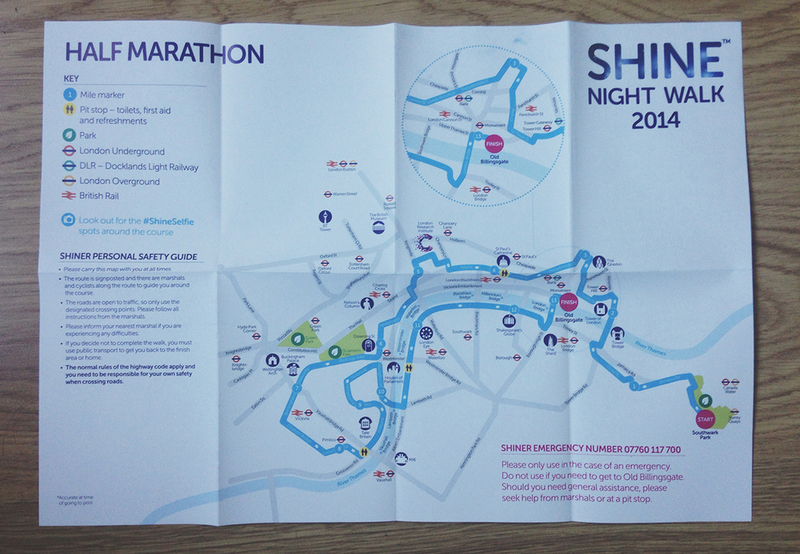 Or would you consider The Shine Night Walk 2015?